From Newbery Medalist Patricia MacLachlan comes a reassuring story about new beginnings and making friends. Nora and her family have just arrived from Russia and are making a new home on the American frontier. The prairie is very different from the forested hills Nora is used to. Most of all, it’s lonely. Papa has the cows he sings to as he milks them. Baby brother Milo has a dog to follow him wherever he goes. But Nora has no one and nothing to call her own until Papa brings home a dozen chicks and two geese. Nora names each one, and they follow her everywhere — even to church! But what will happen when one of her beloved chicks goes missing? Patricia MacLachlan, author of one of my favorite childhood novels, Sarah, Plain and Tall, is still in the business of creating heartwarming children's books. Nora's Chicks, illustrated by Kathryn Brown, is a sweet story that captures the heart of change, family, and finding friendship. Nora and her family have moved to America from Russia. While her family settles in their new home and new surroundings, Nora struggles to accept the change. She misses the view of her dear Russia and feels saddened that she also doesn't have any friends. Her father brings two geese and some chicks as food, but Nora has other ideas for the beautiful birds. They follow her around, even to church, and Nora takes care of them as pets. After a little mishap with one of Nora's chicks going missing, Nora receives more than a returned chick, but a budding friendship with neighbor Susannah. Kathryn Brown's illustrations add a rich softness to the story that glued my eyes to the pages. Even though each page has a few sentences, my eyes wanted to stay on each page to make sure I could fully capture the brilliance of the images. 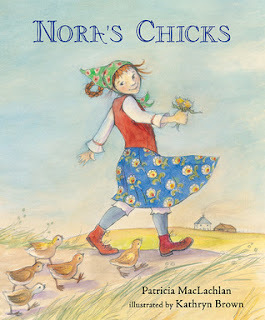 Though it's been years since I've read a Patricia MacLachlan story, I found that Nora's Chicks made me feel as though I was sitting right back in elementary school. Readers will sympathize in Nora's search for happiness, but will ultimately smile at the portrayal of her heartening story. Get 2:32 AM by Emily Ford FREE on Amazon!